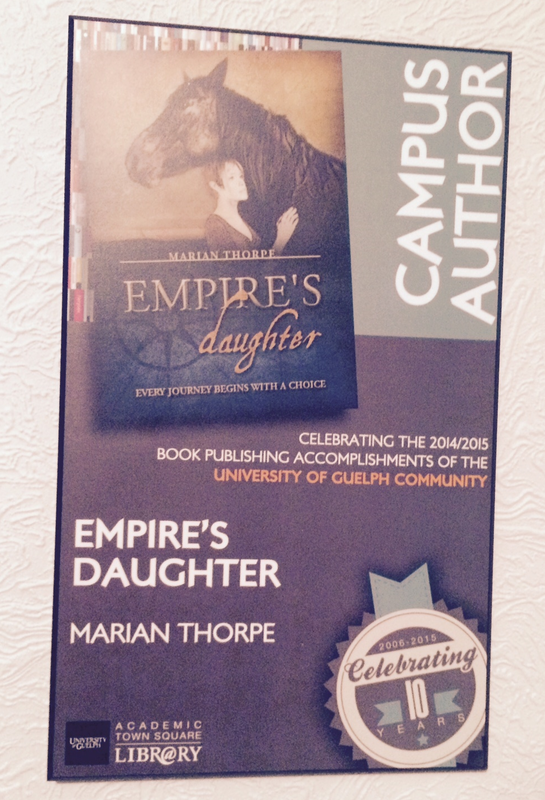 Once a year, my alma mater, the University of Guelph, honours its faculty, staff and alumnae who have published, edited, or illustrated a book in the last year. This year’s honourees included winners of and nominees for some of Canada’s most prestigious literary awards, including Thomas King, Dionne Brand and Alison Pick…and alongside those well-known names was me. Which was a humbling experience, let me tell you. There I was, author of a self-published, moderately successful e-book for young adults, being feted in exactly the same way as these major authors, whose books are taught and read in schools and universities, who have won major prizes….I felt a little bit like a fraud, to be honest. But, on the other hand, the University knew exactly what I had written and published, and they chose to include me (and others like me). I thought that was wonderfully democratic and non-hierarchical….and also typical of my university and its community. My plaque has pride of place on my office wall. I will admit that I do keep looking at it. Thank you, alma mater. May you never change your attitudes and beliefs. That’s beautiful! What a great school — and a wonderful experience for you! Thanks. Yes, it’s a great university, and I’m proud of my 37 year relationship with it!